Imagine a bright sunny day, an open field, and feeling a cool breeze while watching two beautiful roses in full bloom. That is how beautiful a relationship between a Pisces man and a Cancer woman can be. Both are water signs and have a lot in common. The Piscean imagination and creativity will bond well with the Cancer woman’s leadership and energy. The Cancer woman brims with strong intellect. She is also emotional and a family oriented person. This gels well with the Pisces man’s need to be caring and gentle. The Cancer woman’s attitude towards caring for loved ones and showing sympathy when it comes to solving problems is much similar to the Pisces man’s continuous concern for a relationship. 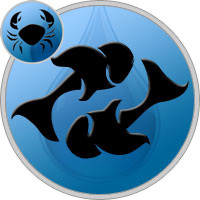 The Pisces man usually looks after his partner’s needs and the Cancer woman is loyal, and likes to pamper her partner. This allows both of them to show similar attitudes in a relationship, and avoid confusion in their day to day lives. The Pisces man and the Cancer woman share a high degree of romance, the reason for which is simple - compatibility. Although the Cancer woman is full of energy and is grounded, she is also shy at times and likes intimacy. The typical Piscean trait of being able to read one’s mind will be more than welcome here. The Cancer woman will interpret this as closeness and strong emotional bonding. Just like this, the Piscean trait of being helpful to the partner is reciprocated equally by the Cancer woman’s trait of organisation and implementation when it comes to family. Any help in form of household work, or even little changes that may make the routine of the Pisces man will sure make life easier and allow the Pisces man to grow fonder of her. The love relationship between a Pisces man and a Cancer woman is very graceful. Both are emotionally needy, sensitive, and love the feeling of togetherness. You can expect hours of cuddling and fondling. Foreplay holds utmost importance and long snuggles after climax are expected. Love is much more than just a physical act and will usually be extremely satisfying, physically and emotionally. You can expect a lot of wriggles, twitches and tugs when this couple gets cosy. One thing that this couple may want to watch out for is possibility of complacency in the bedroom. The Piscean man should be open to perhaps dwell into playfulness and the willingness to explore. Due to high level of sentiments that continually run within the relationship, the Pisces man and the Cancer woman can expect mood swings. This may cause turbulence in this otherwise smooth communion. The Cancer woman is usually picky when it comes to money matters. The Pisces man should be assertive and practical in money matters. They both need to ensure that the Cancer woman’s intellect and the Pisces man’s ambitions are channelized through to the right outlets. Both can also be escapists at times. They should apply high level of caution when it comes to alcohol and other forms of drugs. This may tear the relationship apart. On one hand, you have the Pisces man who is generous and understanding and on the other, you have the Cancer woman, who is fragile yet energetic and disciplined. Match made in heaven - need we say more?